This is a showcase of completed projects that AQURON 7000 concrete Corrosion Protection has been utilised to extend durabililty for concrete structures with exposure to Alkali Silicate Reactivity (ASR), Alkali Aggregate Reactivity (AAR), Delayed Ettringite Formation (DEF) potentials which longterm cause cracking and deterioration of concrete structures. AQURON 7000 Concrete Protection treatment System is a 2-step spray applied penetrating corrosion protection treatment that transforms free MOISTURE to be part of the extensive AQURON induced HYDROGEL formation throughout the concrete matrix. ASR & AAR conditions are overcome by AQURON 7000 concrete protection system. As the AQURON is drawn into the concrete, it deprives any expansive alkali of free moisture which is essential to the ongoing reaction. The free moisture and alkaline hydrates are transformed into a gel and as a result this prevents any ongoing development of expansive products that crack and spall the concrete. 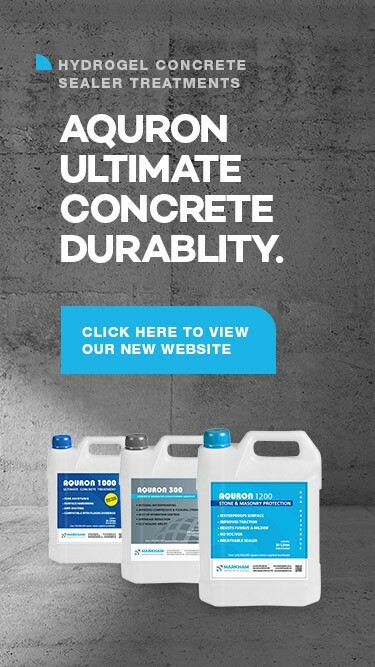 Where ASR/AAR have been active, and cracking has increased the risk of ingress of chlorides and corrosion of the embedded steel, then this is prevented as the 7000 concrete protection system combats any progress of corrosion within the concrete. Development of AAR-ASR, DEF & Sulphate Expansions are arrested. Free moisture and alkalines are bound within the Aquron hydrogel, starving Alkali Silicate Reactivity (ASR), Alkali Aggregate Reactivity (AAR), Delayed Ettringite Formation (DEF) & Sulphate expansion that would otherwise develop and damage reinforced concrete structures.